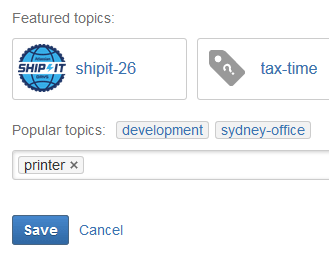 Topics are tags that you use to categorize questions, provide structure and navigation opportunities. Every question must have at least one topic. This ensures there are no orphaned questions in your site. Topics are created when you ask a question. You can remove a topic from your own questions or add additional topics at any time. Sometimes adding a more relevant topic can help get a useful answer to a question. When you ask a question, featured and popular topics appear. 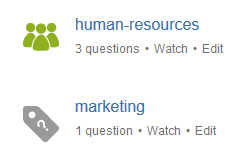 You can choose one of these topics, or start typing a topic - Questions will suggest matching topics. Where possible it is a good idea to use an suggested topic, as this indicates there are already other questions on the same topic. The suggested topic might also be watched by an expert. For example if you have a question about printing. You start typing 'print' and Confluence suggests 'Printer' as a topic, that means there are already questions with the topic 'Printer'. You'll be more likely to get an answer if you choose 'Printer' over creating a new topic for 'Print' or 'Printing'. Featured topics appear more prominently on the topics and ask a question pages. Edit a topic to make it featured. You can watch a topic to be notified when a new question is added. This is a great way to keep informed about what is going on in your site. Choose Watch next to any topics you wish to be notified about (you'll need to be logged in to do this). If you are an administrator you can also add and remove people from the watchers list for a topic. Navigate to the topic then choose Edit beside the Watchers list. You can also follow new questions or particular topics using RSS. Watch out for the RSS link in the Questions list. To view all questions for a topic select the topic in an existing question, or go to Questions > Topics and find it in the list. make it a featured topic. 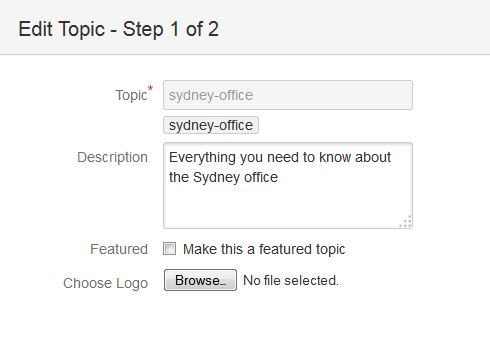 If you have Confluence Administrator permissions you can also create and delete topics. See Administer Questions. Note that you can't change the name of a topic. One workaround is to create a new topic, re-tag all questions and then ask an administrator to remove the old topic (once it has no questions or watchers).